We will meet at Cold Spring and shuttle you to the launch location. We then kayak south along the shoreline to Cold Spring, which is approximately 10 miles. We will camp at a waterfront park and enjoy delicious food prepared in our mobile kitchen by the talented chefs at StockUP and Marbled. The next day we will kayak to Peekskill, which is approximately another 10 miles, before returning via shuttle to Cold Spring. NEW! 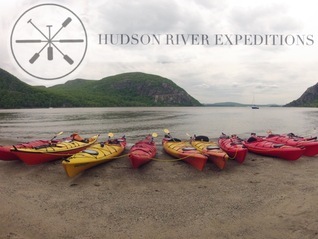 HUDSON RIVER PADDLE 5-day event $1999. Registration open until July 15. Don't miss your chance to join a five-day kayaking trip on one of the most majestic of rivers. On August 1, 2018, we will start in Albany and paddle south on the Hudson River to Poughkeepsie. We will paddle in the mornings and stop at five key locations along the river - Coemans, Athens, Saugerties, Kingston, and Poughkeepsie to explore. At each location explore what each for all it has to offer in culture, history, and natural beauty. The ACA L1/2 Introduction to Kayak/Essentials of Kayak Touring ICW is a combined training and certification designed to prepare paddlers for the transition from enthusiast to instructor. The first two days of the course will focus on refining individual skills, session planning, content delivery, observation and assessment, learning through gaming, managing sessions and groups, making learning happen, and having fun. The final day will be an instructor assessment where candidates will deliver a variety of instructional sessions in either the Level 1 or Level 2 instructional venue. Our goal is to develop competent instructors, who are able to meet the needs of diverse groups of paddlers, through fun, engaging, and intentional sessions. Pre-requisites: Candidates interested in ACA Instructor Certification must possess current First Aid and CPR credentials (ACA FA/CPR Requirement). You may participate in the assessment without FA/CPR credentials, but your certification would be pending until proof of FA/CPR is confirmed. While there is no formal skills requirement to participate in the Level 1/2 ICW, it is expected that all candidates are able to paddle at a skill level, commensurate with their desired level of training, prior to the course. The staff at HRE can help you determine if you are ready for the ICW, and help you get there if you are not. Occasionally, injuries happen in the context of adventure sports, and as both enthusiasts and professionals we need to be prepared to treat, manage, and avoid injury in remote settings. SOLO Wilderness First Aid (WFA) is an introductory course designed to develop both decision making and management skills that address common backcountry injuries. The WFA course focuses on "hands on" learning, where students are engaged in managing authentic scenarios; scenario based learning is supported by brief classroom discussions and reinforced with intensive practical work. ​This one day, hands on, classroom-based course is designed for paddlers carrying out coastal journeys, including islands up to two nautical miles offshore in areas of tidal movement up to up to two knots and winds of up to force four. Participants will develop both competency and confidence journey planning using navigational resources from the United Kingdom and North America. This course is a must for paddlers interested in refining their coastal planning skills, and/or for those pursuing the British Canoeing Sea Leader Award (old 4 Star Leader), as it is a prerequisite for Sea Leader Training. For additional information and learning outcomes please visit British Canoeing. *BC award, required for Sea Leader Training, additional charge $20 PNA members, $40 nonmembers, payable at the course. The ACA ICW provides SUP Instructors the basics of water safety and a solid framework of SUP teaching techniques. 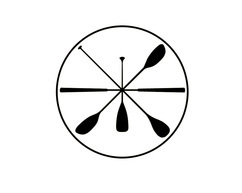 This three-day program is an intensive, fast paced workshop designed to refine your instructional techniques and familiarize you with the processes and curriculum of the American Canoe Association. Students aspiring to be certified as SUP instructors will need to have current certifications in both CPR and First Aid. In the Instructor Certification Workshop (ICW) you will be assessed in the following areas: Personal Paddling Skills, Teaching Skills, Modeling Skills, Risk Management, Group Management, Technical Knowledge, Coaching and Assessment. Pre-requisites: Proficiency with basic skills outlined in ACA Instructor Criteria, ACA Annual Membership, First Aid and CPR certification, 18 years of age or older. The staff at HRE can help you determine if you are ready for the ICW, and help you get there if you are not. Hudson River Paddle ​(August 1-5). Registration for single-day rates for the Hudson River Paddle is now OPEN. You can join us for a day paddle or combine it with an overnight, which includes lodging, camping gear, catered meals, paddling equipment, shuttle to area attractions, and all event registration fees! Just bring yourself and your excitement for a great paddle from Albany to Poughkeepsie. Learn more at hudsonriverpaddle.com. We are also available for private guided hiking or snowshoeing throughout the year. This kayak is roomy, stable, and has great tracking. It is well-suited for a variety of paddlers. You can see it being paddled by Jill Wagner on Handcrafted America. See more beautiful handcrafted wood kayaks at Moonlight Marine. RiverKeeper Sweep is on May 5! There are 100+ cleanup locations along the Hudson. Our Peekskill launch and Cold Spring's Dockside Waterfront Park and Little Stony Point are some of these spots. Many local breweries are offering a free beer post-cleanup! See www.RiverKeeper.org for locations and registration. 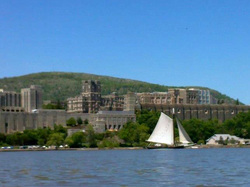 A great open river paddle through World's End and across the Hudson to land at USMA West Point. The paddle through historic World's End showcases a dramatic shoreline where tall cliffs plunge into the river at its deepest point. The gorgeous views of nationally historic West Point and the surrounding Hudson Highlands is awe inspiring. The tour's West Point destination avails guests the opportunity to take a short walk through the campus's parade ground and Kosciuszko's Garden. Suggested for participants with some on water experience. Please bring government-issued ID for access. These are two-hour clinics held on high-water evenings at our Peekskill location. The clinics begin at 6:00pm-8:00pm but may shift to an earlier time as the season progresses for sunlight. It is $45 per evening or $200 for a 5-clinic package. Camaraderie • Trust • Competition • Challenge • Goal Setting • Action-Planning • Communication • Fun • Problem-SolvingRarely can a business prosper without teamwork. From a “mom-and-pop” shop to a global corporate conglomerate, the glue that binds the success of any business, small or large, is teamwork. Whenever people play, create, and achieve a common goal together; something magical happens. Interpersonal relationships grow, morale improves, and cooperation increases. Suddenly the lines dividing business owners, managers, and employees dissolve, revealing a cohesive, integrated, and prosperous organization with an appetite for success. At Hudson Valley Outfitters (HVO), we share your desire to boost performance and foster teamwork within your business. We combine Professional Facilitation with unique Challenge Programs to energize the bodies and minds of your workforce, boost their confidence, and cultivate their abilities to work as a team to accomplish shared goals. But most of all, we make training fun and memorable! We help create experiences that managers and employees alike will likely draw upon for years to come for inspiration and motivation. Our mission is to activate, mobilize, and viscerally involve our clients with each other and their environment in order to enhance performance, topple barriers to success, and overturn any lingering stereotypes that might impede our clients from being their best! Located in Cold Spring, New York, along the majestic Hudson River in the heart of the Hudson Highlands, HVO is easily accessible from NYC and virtually anywhere in the tri-state area. From kayaking to hiking, our experienced instructors combine physical, intellectual, and creative challenges in a relaxed atmosphere. We will work hand-in-hand with you to develop a custom-designed program that focuses on developing the leadership and teambuilding skills essential to any successful organization. Whether you’re looking for an innovative and fun way to expand the productivity of your business, or if you’re just seeking that “extra edge,” call us to learn how we can help your employees find their true potential! ​A wide loop trail surrounds the perimeter of this peninsula with full riverfront exposure, the railway will not divide you from the water. Relax on the sandy beach or take a short climb up to the peak for a commanding view of the surrounding highlands. ​There's a bit of a scramble getting to the top but the open ridge that takes you from the Hudson River to the top of South Beacon Mountain is worth the climb. The views are awe-inspiring! ​This trail climbs steeply to reward you with amazing views from several vantage points. It meanders through wooded areas and an abandoned quarry. 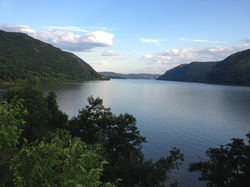 Stop to take in the views of the river, Storm King, Breakneck Ridge, the Shawangunks, and the Catskills. This exciting instructional kayaking program is a collaboration between the Ossining Recreation & Parks Department and Hudson River Expeditions’ American Canoe Association certified coastal kayaking instructors. This course will focus participants on self- and assisted-rescue techniques through demonstration, instruction, and practice. These skills will make any paddler safer and more confident knowing what to do in the event of a capsize, which leads to more enjoyment on the water. 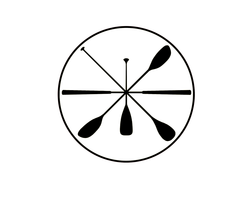 The instructors will introduce key safety equipment and exemplify safe use. The safe practices of wearing a spray skirt, strokes techniques, and maneuvers will also be introduced. Equipment provided includes kayaks, paddles, life-vests, and safety equipment. See registeration information on the Ossining Recreation and Parks winter brochure. Stand-up paddleboarding (SUP) is one of the fastest growing watersports in the world, it's all about paddling and the glide, perfect for the Hudson River. This class will teach you the necessary skills, orientation, and water safety to get you out paddling and having fun. Instruction is dedicated to help you learn a new sport properly and not suffer stress injuries due to improper use of equipment. Balance, stance, basic paddle strokes, and self-rescue techniques, yes expect to get wet, are all part of the training. The ACA-instructor certification workshops are widely recognized as one of the industry standards for those who wish to teach paddle sports. These programs are designed to develop an individual's on water skills, teaching ability, and leadership skills. Paddlers who are not interested in instructing will find these classes a valuable learning experience that helps bring their skills to the next level. The Instructor Certification Workshop (ICW) is a combination of instructor training and testing. In the ICW you will train, test skills, work in conditions, and demonstrate teaching methods. This weekend is a challenging, fast paced, immersion into learning that's a lot of fun and very rewarding! Previously certified instructors may attend this workshop to update their certification. Looking to improve and build upon your existing set of skills? This course is offered as a follow up to our BASIC STROKES or for those who have been paddling and want to find a more efficient way to paddle. We will learn to link strokes in this course; Bow & Stern Rudders as well as side slipping will be covered in this course. Pick a paddle and join Master Storyteller Jonathan Kruk and Hudson River Expeditions guides Melia Marzollo and Brian Grahn for a one-of-a-kind Hudson River experience. 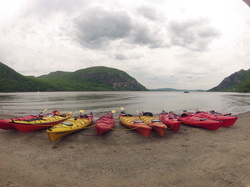 Tour in Tales Adventurers can choose a kayak or paddleboard for this tour, which takes us north along the banks of Cold Spring to gaze at Storm King Mountain, Bannerman Castle, and Breakneck Ridge, and hear the tales of the Hudson Highlands that make them all come to life! A longer itinerary with on-land and underway paddling instruction designed for the paddler looking to improve paddle strokes, work on recovery skills, pre-planning, and equipment. The instructor will also work with the group to ensure additionally desired improvements are incorporated within the day. Participants should have some experience or have taken an introduction to paddling class. Be prepared to get wet and have a great experience to build upon your skill set. This tour is designed to provide introductory instruction while also giving the opportunity to stretch out on the water. We will paddle up to the locals' favorite sandy beach where a sheltered, slow-gradient shoreline allows for group discussion and skills exercises. Paddlers should be willing to get wet and be prepared with appropriate attire. Gaining techniques and skills will give you a leap forward in your confidence to pursue greater challenges on the water. Here’s a great way to get fit out on the water with a fun and challenging class. The fitness formula includes whole-body strengthening and a cardio workout plus the added benefits of training on water--balance, focus, and board skills. Expect to do pushups and square while balancing on your board with paddle sprints in between sets. 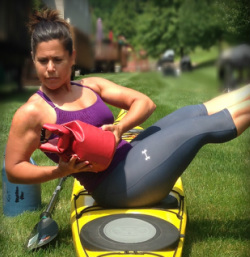 This class accommodates all skill and fitness levels but participants must have some prior experience and comfort with using a stand-up paddleboard. We offer an Introduction to SUP class on Monday nights at 6:00pm if you need a skills lesson prior to the fitness course.